Large, quick growing subshrub of open bushy habit with ovate, light to mid green leaves. Freely produced spikes of rich violet-purple flowers with darker purple calyces. Very long flowering season. Best in well drained, moderately fertile soil and a warm sunny position. Top growth is not frost hardy and it is best to protect the roots in winter with a thick mulch. Dislikes cold heavy conditions and may be tricky to over-winter in cool regions. Remove old flowering shoots regularly. 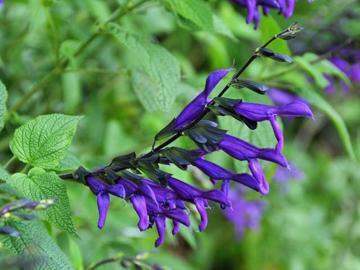 Hybrid of Salvia guarantica x Salvia gesneraeflora 'Tequila', raised by Fred Boutin, Huntington Botanical Gardens, California, USA, 1977 and introduced in 1980.